This week’s walk, courtesy of www.casualramblers.co.uk, is a stroll from Brighouse to Clay House in Greetland. From Sainsburys in Brighouse, turn left and then right to follow the canal towpath behind the supermarket for about half a mile to Ganney Lock. Here the route turns left over the bridge towards a large firm called Avocet. Turn right over the canal and out along this short stretch of road to reach the main road. Take care whilst crossing this road as cars do tend to speed along here. On the opposite side you will see a wide track bearing left uphill. Cross the stile to follow the track. Keeping a high wall on your left you will pass an electricity pylon. Climb the stile on the left hand side of the wall to follow a path which leads downhill to a farm. Turn right along a grassy track, climbing gently into Cromwell Wood. Continue uphill until the path becomes a walled lane, and then turn left down a paved track Be very careful here as this part can get very slippy. Go over the stream to a very small gap in the wall. At the top turn right into Cote Hill Farm Lane. Turn immediately left through a small gap in the wall where a sign points towards the houses at the far end of this field. In the top right hand corner, follow a short diversion around the edge of the livery yard as it bears right then left, passing the end of a house on your right. Climb small stone stile to follow a tarmacked road along School Lane. Continue straight ahead to reach the main road and then turn right to reach the bus stop at Southowram. Turn immediately left along West Lane towards Siddal, passing Marshalls on your left. When you pass a house on your left, with a caravan, there is a track leading in front of the house. Enter the lane, and then immediately turn right. You will spot some faint Calderdale Way markings on the boulder. Climb the stile and then turn right, again following a faint path through the fields to reach a stone stile in the wall to your right. Climb the stile and head downhill towards the back of the school to your right. Climb a couple stiles and out onto the main road. Turn left and head uphill towards the farm. Here at the top, in the corner opposite some cottages climb the stile on the right and follow a path downhill to reach gate. Go through the gate and turn right downhill, following a winding path through a gap in the wall and then through a steep woodland. 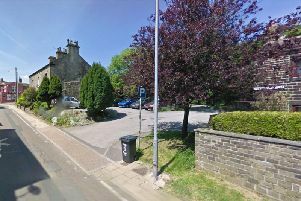 Descend the steep steps where you will arrive on the pavement of the very busy A629. Taking extreme care over this stretch of road, follow the path further downhill to reach the canal here at the bottom. Turn right and follow the footpath under the small and dark tunnel. Here sits the guillotine lock and picturesque canal basin at Salterhebble. To reach Clay House at Greetland to finish the walk, head back to the main road and turn right, following the road under the railway bridge. You can either walk up the steps by the car park, or carry on a little further until, where a couple of metal gates leads you uphill to Clay House.